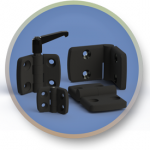 We offer a wide variety of hinges for various different purposes. Whether your hinges need to be plastic or metal, concealed or clad, or fixed or lift-off styles we have a hinge that will integrate well into your assembly. 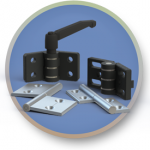 Lift-off hinges are perfect for removable windows or doors with areas that need constant maintanance. We also have fixed position hinges that snap into position at predetermined angles. Do you have a very heavy door? Try our heavy duty metal hinges. We are determined to create a hinge solution catered to your needs.